President Nurse Nora Manns (seated) with her Board Members. 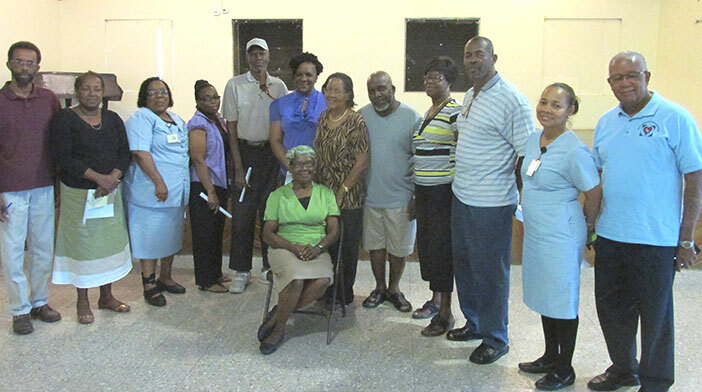 A group of interested persons turned out at the East End-Long Look Community Centre to learn more about the importance of establishing a branch in the Eastern area of Tortola. The meeting was opened by Chairman Bennet Smith, vice president of the BVI Diabetes Association and also the Tortola Central branch. President: Nurse Nora Manns; Vice President Cynthia Brannigan; Secretary Maralyn Richards; Treasurer Atlee Chalwell; Assistant secretary/ treasurer Nurse Suzette Williams; PRO Dawn Smith-Bryan, while Kareen Brice, Weine Hutchinson, Edith Penn, Percy Fahie and Binaldo Frett will serve as board members. Mrs. Wenzke congratulated the new board, pledged her support and presented a check to the treasurer to get his accounts started. The BVI Diabetes Association has now four branches: Virgin Gorda with President Franka Pickering, Western Branch President Gerda Smith-Wallen, Tortola Central branch President Astrid C Wenzke and the new Eastern branch, led by President Nora Manns.